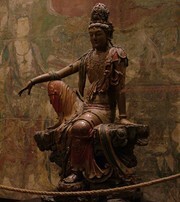 History, Types, Characteristics, Famous Wood Sculptures. Carved in lindenwood by Michael Pacher. One of the oldest types of art, woodcarving is an art-form common to all cultures, from the Stone Age onwards, not least because of its widespread availability, plasticity and low cost. Its only real drawback as a medium for sculpture is its perishability. Being water absorbent and vulnerable to insects and airborne fungi, wood can degrade quite rapidly. As a result, bronze, marble and other types of stone have been preferred for monumental works. Even so, wood was the principal type of African sculpture used to produce masks, statuettes, religious objects and general decorative items. The medium was also widely used in Oceanic art for the carving of ceremonial canoes and other objects, as well as in the totem pole culture of American Indian art and in the Aboriginal art of Australia. Unfortunately, most of this type of ancient tribal art has perished. Wood carving was also common in Greek sculpture, although it was far less prestigious than ivory carving, and used mostly for small-scale works. The medium flourished later in Europe, alongside medieval, Romanesque and Gothic architecture, chiefly in churches and cathedrals, and later alongside fine furniture and interior decoration, notably in the idiom of Rococo art. During the 20th century, plastic art has used wood in a number of innovative ways, not least in the assemblage art of Louise Nevelson (1899-1988) and others, while 20th century folk art continues to depend on the medium. Paleolithic art and culture is full of examples of prehistoric sculpture, of which the best known instances are the Venus figurines, carved from a variety of ivory, animal bone and rock. No doubt wood was also widely used, though little of it has survived. The fact that we have the Shigir Idol (7500 BCE, Yekaterinburg, Russian Urals) - a masterpiece of Mesolithic art - is nothing short of a miracle. Wood was also in widespread use throughout all the ancient civilizations, notably in Japanese art, as well as Mesopotamian art and Egyptian art. It was also common in Archaic Greek sculpture, although, as first marble sculpture and later bronze sculpture grew popular, the use of wood as a primary material declined rapidly. By the time of Early Classical Greek sculpture (c.480-450), the art of wood carving was restricted to small-scale works only. Even here, chryselephantine sculpture dominated. Note: In Korea and China, jade carving was the most prestigious type of carving. 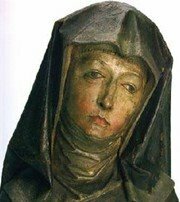 The greatest wood carvings in the history of sculpture were produced during the Late Gothic era in Germany (c.1470-1530), when a number of outstanding examples of altarpiece art, and other religious works were created. (See: German Renaissance Art, 1430-1580.) Wood sculptors from this era include the celebrated German master artist Tilman Riemenschneider (1460-1531), who carved the celebrated Holy Blood Altar (1499-1504, Rothenburg) as well as a series of stunning limewood carvings, including altarpieces, reliefs, portrait busts and life-size statues, characterized by bold Gothic symbolism and realistic carving. Other famous German wood carvers include Veit Stoss (1445-1533), best known for the High Altar of St Mary's Church, Krakow (1484); Michael Pacher (1435-98), famous for the St Wolfgang Altarpiece (1471-81); Gregor Erhart (c.1470-1540), famous for his statue of St. Mary Magdalene (c.1510, Louvre); and the mysterious Jorg Zurn (1583-1638), who produced the dazzling spruce and limewood Altar of the Virgin (1613-16), in Uberlingen. Sculpting in wood, usually oak, also underwent something of a revival in England during the 17th century, with the work of Grinling Gibbons (1648-1721) - see, for instance, his Woodcarving of a Cravat (c.1690, Victoria & Albert Museum). The art of wood carving was also maintained by English cabinet-makers like John Linnell, John Cobb, Benjamin Goodison, William Vile and the eminent Thomas Chippendale (1718-79). On the Continent, woodwork traditions were upheld by a number of Rococo artists including: (in France) Foliot, Lelarge, Sene and Cressent; (in Germany) Oeben, Riesener and Weisweiler; and (in Italy) by the great designers Filippo Juvarra (1678-1736) and Bernardo Yittone (1704-1770). Famous modern artists who have sculpted in wood include: the Romanian Constantin Brancusi (1876-1957), whose first work was a violin; the English sculptor Henry Moore (1898-1986), noted for his smooth wooden sculptures like Reclining Figure (1936); Barbara Hepworth (1903-75), another exponent of biomorphic abstraction, famous for her use of "negative space"; the painter Paul Gauguin (1848-1903), noted for his primitivist relief sculpture and wooden masks; the expressionist Ernst Barlach (1870-1938); the Polish sculptor Xawery Dunikowski (1875-1964), who carved the striking Motherhood (1908, Warsaw National Museum); the Belgian abstract sculptor Georges Vantongerloo (1886-1965) who created Construction of Volume Relations (1921, MOMA, New York); and Louise Nevelson (1899-1988) - noted for her modernist assemblages of 'found' wood. Methods and styles of wood carving include chip carving, relief carving, and Scandinavian flat-plane. Both softwoods and hardwoods are used, principally oak, mahogany, walnut, elm, limewood, chestnut, ebony, boxwood, cedar, cypress, olive, teak and pine. Wood has both advantages and drawbacks as a sculpture medium. Because of its fibrous strength, it can be carved more thinly and precisely than stone or animal bone. For large compositions, two or more pieces of wood may be carved then joined. Hardwoods are more difficult to sculpt but possess greater lustre and endurance, while softwoods are easier to shape, but less durable. No wood is as durable, weatherproof or insect-immune as stone, and thus is used mainly for indoor works. Lastly, whatever wood is used, it remains an anisotropic material (its properties differ when measured in different directions), and is strongest in the direction of the grain. Thus sculptors carve their most delicate lines with the grain rather than against it. Wood carving tools include the following: a special carving knife used to cut and pare the wood; a gouge with a curved cutting edge used for making hollows and curves; a specialist gouge called a veiner, with a U-shaped edge; a straight-edge chisel used for lines; as well as various mallets and hammers. The sculptor starts by choosing a block of wood appropriate to the shape and scale of his intended design. Employing gouges of various sizes, he then reduces the wood to an approximate shape, which he refines with a variety of tools like veiners and v-tools. When the detailed work is complete, the sculptor smoothes the surfaces with implements like rasps and rifflers, and with different grains of sandpaper. Lastly, to enhance and preserve the sculpture, he stains it walnut or linseed oil, and then coats it in varnish, resin or wax. - The Shigir Idol (7500 BCE) Yekaterinburg, Russian Urals. - Rottgen Pieta (1300 CE) Lime wood, Rheinisches Landesmuseum, Bonn. - Mary Magadalene (1455) Bargello, Florence. By Donatello. 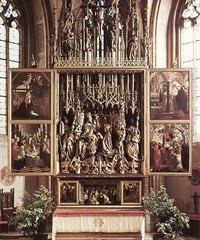 - St Wolfgang Altarpiece (1471-81) Church of Sankt Wolfgang. By Pacher. - High Altar of St Mary's Church, Krakow (1484) By Veit Stoss. - Holy Blood Altar (1499-1504) Linden wood, Rothenburg. By Riemenschneider. - The Head Of St Anne (1500) Limewood, Hermitage. By Riemenschneider. - Mary Magdalene ("La Belle Allemande") (1500) Limewood, Louvre. By Erhart. - The Annunciation (1518) Church of St Lorenz in Nuremberg. By Veit Stoss. - Descent from the Cross (1513) Victoria & Albert. By Jacopo Sansovino. - Raphael and Tobias (1516) German National Museum Nuremberg. By Stoss. - Altar of the Virgin (1613-16) Spruce/Limewood, Uberlingen. By Jorg Zurn. - Woodcarving of a Cravat (1690) Victoria & Albert Museum. By Gibbons. - Motherhood (1908) Wood, Warsaw National Museum. By Xawery Dunikowski. - Construction of Volume Relations (1921) Mahogany, MOMA. Vantongerloo. - Sky Cathedral (1958) MOMA, New York. By Louise Nevelson. - Reclining Figure (1959-64) Elmwood, UK. By Henry Moore. - Open Geometric Structure IV (1990) Wood, London. By Sol LeWitt.  For more about wood-carving, see: Visual Arts Encyclopedia.